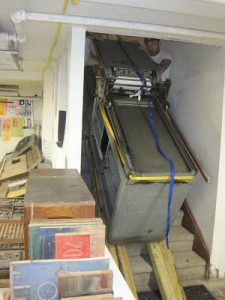 Once upon a time, Mandy, our beloved Vandercook 4, didn’t live here at the WNY Book Arts Center. 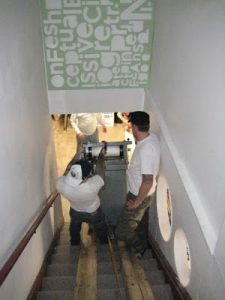 When we first moved into our downtown location we only had our 219 and SP20 letterpresses. Mandy’s story is a story worth telling. Or re-telling, as the case may be. If you care to search far enough back in our blog, you could find the original post published right after we acquired Mandy. Or you could just read this re-telling of the story, which, I promise, will be just as good. We got Mandy from the Platen Press Museum in Zion, Illinois back in 2010. That’s right, Mandy traveled more than 500 miles to get here. And you know what that means: roadtrip! 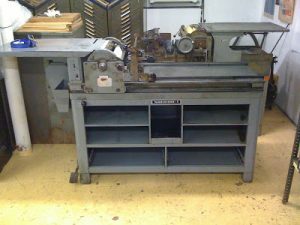 Vandercook 4s, the model Mandy is, aren’t all that uncommon. There are still several thousand known to exist. Still, that’s nothing compared to the height of the Vandercook era. Which is why one must occasionally travel 500 miles to obtain a Vandercook 4. We acquired Mandy when WNYBAC founder Rich Kegler and friends made the trip down to Two Rivers, Wisconsin for the Wayzgoose at the Hamilton Wood Type Museum. Mandy was a stop along the way back up. 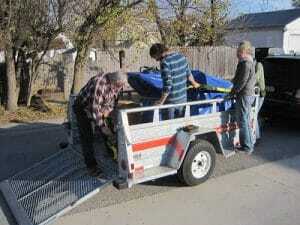 When we got Mandy, to drive her to Buffalo we relied on a u-haul trailer. When transporting a press, the most important thing to remember is to keep it secure. Since our trailer was open top, we also covered Mandy with a waterproof tarp to keep her safe. Adventures abounded on the trip back to Buffalo. From getting lost, to learning Yiddish, to enduring weather and traffic, all to the accompaniment of great music. The fun, of course, didn’t end once we got Mandy back to Buffalo. 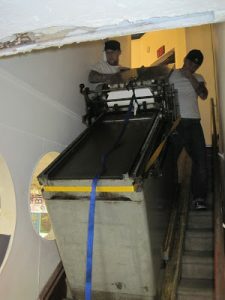 Then there was the matter of unloading her, getting her in the door, and getting her down to the studio. 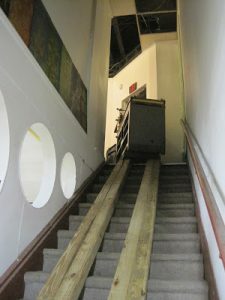 As you know, WNYBAC’s studio is in the basement, meaning we would have to traverse a flight of stairs with the 1100 pound machine. 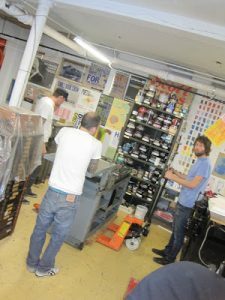 But if we did it before with our other two letterpresses, surely we could do it again! Mandy, ultimately, made it all the way from Illinois to our basement studio safe and sound. In her home here she is used for everything from teaching workshops and field trips, to pulling prints for our store merchandise. 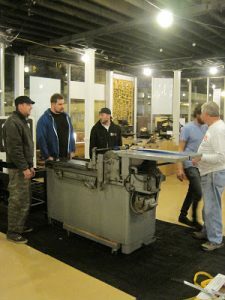 We’re happy to have our little Vandercook 4! Posted on February 10, 2019 by Rosemary Williams.